Commonwealth Commercial Real Estate, founded in 2004, is a recognized leader in commercial real estate leasing, sales and advisory services with nine licensed real estate agents. 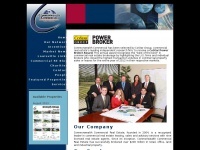 The web server used by Ccre.biz is run by GoDaddy.com, LLC and is located in Scottsdale, USA. There are many websites run by this web server. The operator uses this server for many hosting clients. In total there are at least 15,657 websites on this server. The language of these websites is mostly english. Only a few websites on this web server are x-rated.